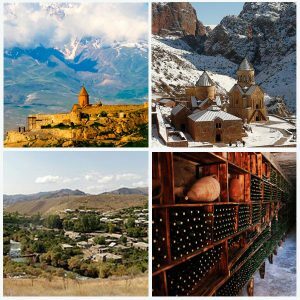 Start and end in Yerevan – the capital of Armenia. 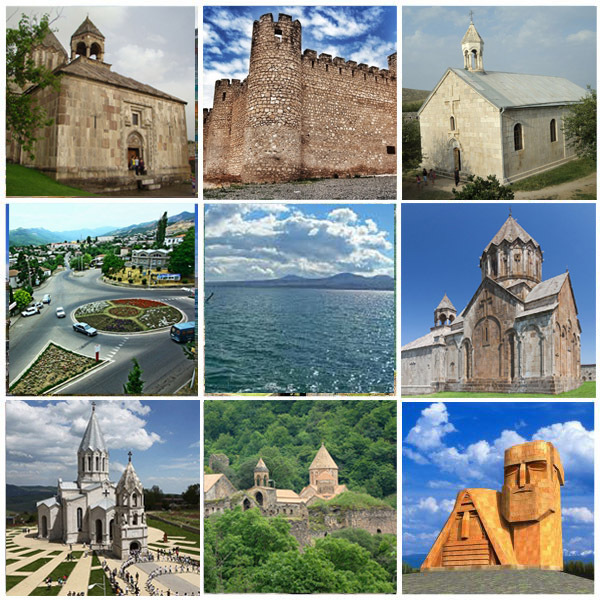 This is a 5 day tour to take you through popular tourist attractions in the Republic of Artsakh. 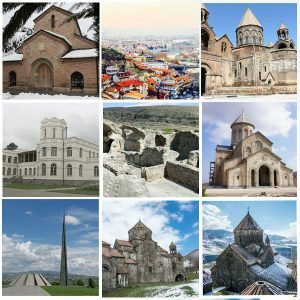 At first you will visit the city of Goris at the border with Artsakh, continue to Shushi and stay overnight in Stepanakert – the capital of the Republic of Artsakh. Visit the medieval monastery of Amaras and the ruins of Tigranakert dated back to the 2nd century BC. 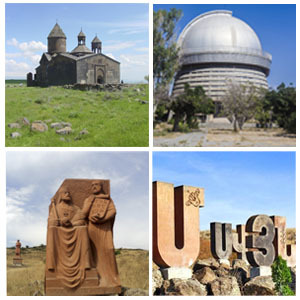 Travel to 13th century Gandzasar monastery then on to Dadivank monastery built in the first century AD. Return to Yerevan with a stop at Lake Sevan – an alpine freshwater lake set at 1,900 m above the sea level. Arrival at the Zvartnots International Airport and transfer to hotel. 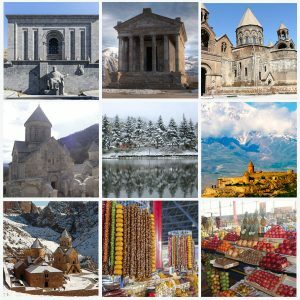 City tour of Yerevan – one of the ancient capitals in the world – 29 years older than Rome.Welcome dinner at a traditional Armenian restaurant. 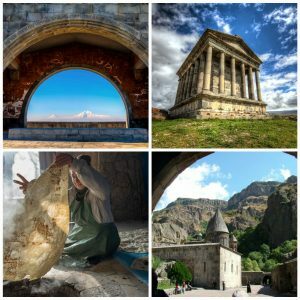 Travel south of Armenia to Goris – a beautiful city located in the valley of Vararak River and surrounded by Zangezur Mountains. The city has a distinctive character with its city plan designed by a German architect in the 19 th century. Dine in Goris to sample local delicacies. Continue to the Republic of Artsakh. Visit the fortress city of Shushi situated on an elevatStepanakert –ion of 1,400-1,900 m. Explore local landmarks and traditional houses. Continue to the capital of the Republic of Artsakh. Overnight in Stepanakert. 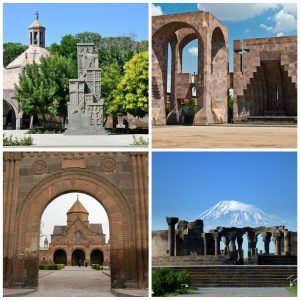 Travel to Amaras monastery founded in the 4 th century by Gregory the Illuminator – the first head of the Armenian Apostolic Church. Continue to the ruins of Tigranakert dated 2nd century BC. Return back to Stepanakert for an overnight stay. Travel to the functioning Gandzasar monastery (meaning the “treasure mountain”) built in the 13th century. The monastery holds relics believed to belong to John the Baptist and his father St. Zechariah. Then on to Tsovin Kar (meaning “Sea Stone”) to enjoy the national cuisine of Artsakh. Continue to Dadivank monastery believed to be built during the first century AD by St. Dadi who was the disiple of Thaddeus – one of the twelve Apostiles of Jesus. Return to the Republic of Armenia. Stop by the Lake Sevan. Continue to Yerevan. Breakfast at the hotel. Departure. Transfer to Zvartnots International Airport.